Here in North America, Halloween is a big deal for many. The biggest tradition is 'trick or treating' which involves children dressing up in costumes and going from one house to the next collecting candy from each home. Candy candy candy ... is a huge part of Halloween here. This tradition of 'trick or treating' is more cultural than historical, I am sure. And is very commercialized. The stores around here, for weeks (and sometimes months) before Hallowe'en sell candy specially made to be given out to kids on Halloween night. 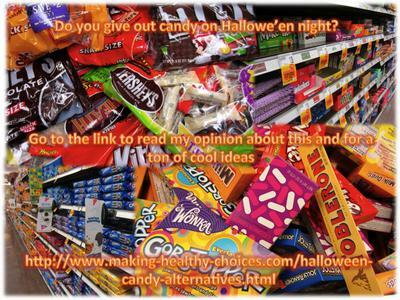 So what do I, as a Holistic Nutritionist and Health Advisor, think about this candy-filled tradition? Well my answer may surprise you as I tell you that I am not against the whole idea. I grew up with this tradition and, quite frankly it is a lot of fun. As a child, it is exciting and exhilarating to dress up in a costume and run around the neighbourhood collecting sweet tasting and fun treasures. As an adult, it is also fun to watch a continual stream of costumed little ones parade past your door. I am a huge proponent of balance. If you and your children eat healthy almost all the time, then is splurging on some candy at Hallowe'en a big deal? Probably not. If there is balance most of the time in what we eat and do (ie diet and lifestyle) then indulging every once in a while is not only okay, it is healthy! But, unfortunately much of the population don't eat very healthy on a day to day basis and the influx of candy on Oct 31st only exaggerates health problems that may already exist. is up to parents to monitor what their children collect and how much they eat at any given time. What I want to do in this blog post is, not condemn candy-giving but, just provide some other alternatives to those that would like to offer something other than candy. As a child, I liked getting candy but I also liked when I would find toys, games and other non-candy items in my bag. gift certificates to mini-putt places, movie theaters, etc. And don't forget that trick or treating isn't mandatory. If you want to do something different then plan a fun evening at home, making everyone's absolute favourite things to eat and engaging in activities that your kids love to do. Or even better, get together with other families and plan a great evening. Always remember the essence behind what you are doing. Halloween is supposed to be fun for children, allow them to have a good time. We are handing out Halloween balloons at my store..popcorn is also a favorite. Your list is great, and your right, once in awhile a healthy kid (or adult who is binging on thier kids candy while said kids are asleep, wink wink) can indulge. I personally hand out sticker puzzles, so they have something to do while eating candy, lol. :) I don't get as many return kids in the same night, but I know they appreciate it, I did too when I found a small toy instead of another taffy when I was a child. Happy Halloween to you and all your readers. Someone commented that it could get expensive to buy 200 of these items. I have recently seen stores that sell non-candy items packaged specially for Halloween (mini and individually wrapped)... that are not priced any higher than the candy. In many cities there are now Halloween Stores that open up just for Halloween and they also have many novelty and non-candy items just for this purpose. Another idea would be to shop at dollar stores or flea markets, occasionally you can find suitable items there as well. Unfortunately the idea of apples and other fruit (along with anything homemade) will probably be screened by parents because of the scare of them being tainted. I absolutely love your list of giving something other than Candy. They do get enough candy all year long and the less we can provide the better. The only concern I have is where does a person get 200 items to hand out without spending $200. It could get pricey but I still like the ideal. One more thing you could add on the list is Apples. There are a lot of apple tree loaded at this time of year that don't ever get picked. Maybe find someone that would allow you to pick just for the Halloween giving. ... just don't let them overeat till they get sick with tummy aches or bounce off the walls for hours on a sugar high. You are right, it is up to us parents to monitor and instill good habits but I do like to let them go a bit wild too!!! I do like your non-candy list, very creative. Another idea for your list is bags of beads for making jewelry - my girls would love getting that!! and baseball cards - my son would love that! !